What business does body image have in the workplace? A lot, according to our recent healthcare survey. We worked with Lisa Himmel, co-author of Hungry: A Mother and Daughter Fight Anorexia, to perform a medical research study on people’s body image and workplace habits. Himmel, who’s working on her next project, used SurveyMonkey Audience to reach 300 employed Americans. 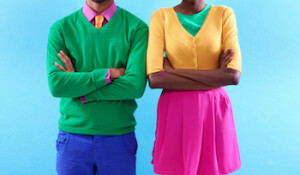 She wanted to determine how much an employee’s focus on their appearance affects their perceived success, attention, and overall happiness in the workplace. And when it comes to self-esteem and business success, the results may surprise you. So how do the nearly 40 percent of people who say their appearance is very or extremely important to them fare at work versus those who don’t think it’s as important? When we compared people who answered the question, “How successful do you consider yourself in your career?” with those who answered the question, “How important is your physical appearance to you?” we found that people who consider themselves to be successful are more likely to say that their physical appearance is important to them. Want to run your own research project at an affordable price? We’ve got millions of profiled people ready to take your survey. 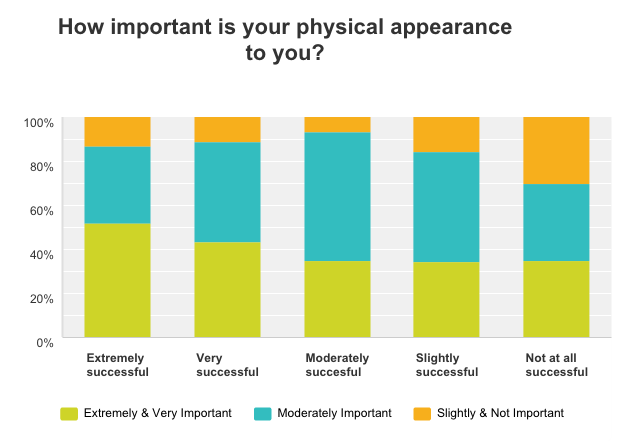 So the majority of people say that their appearance is at least moderately important to them. But does that mean they’re aware of their appearance all day? When we asked, “How often do you find yourself thinking about the way you look?” 62 percent of people say they sometimes think about how they look. A quarter of respondents say they think about it most of the time, and even fewer say they always think about how they look (five percent). And what about while they’re on the job? 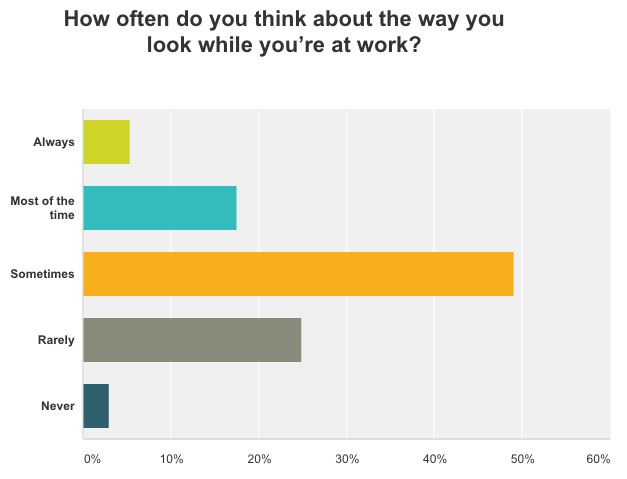 Forty-nine percent say they sometimes think about the way they look while they’re at work, followed by 25 percent who say they rarely do, and 18 percent who say they do most of the time. Eighteen percent of people who are extremely or very proud of their body report that their average household income is $150,000 or more, which is higher than in any other income bracket. 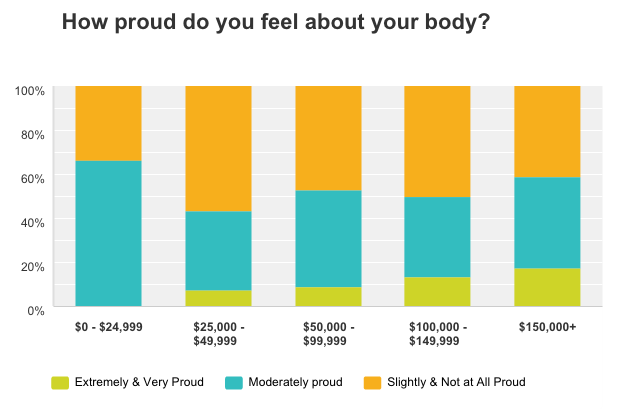 And the majority of people who report an average household income of $25,000-$49,000 say they’re only slightly or not at all proud of their body (56 percent). Also, when it comes to a raise or promotion, 54 percent of those who are at least moderately proud of their body have received a raise or promotion in the past year, compared with 46 percent of those who aren’t proud of their body. When we compared how women and men answered the survey, the results didn’t show significant gaps at first. 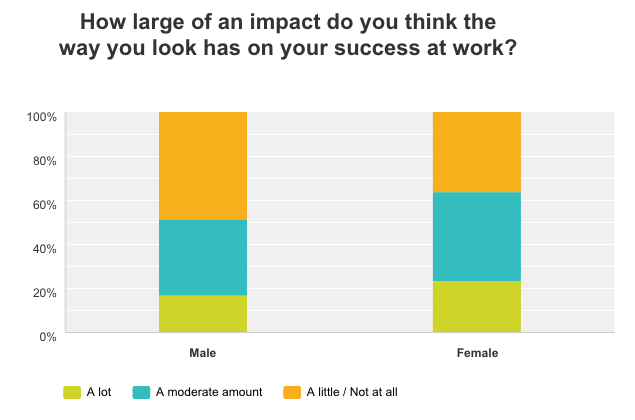 On average, women answered questions about the importance of their career, how successful they consider themselves to be, and how focused they are at work—just about the same as men. Additionally, 48 percent of men say that they feel they get the credit they deserve for their work accomplishments always or most of the time, compared to 37 percent of women. We also learned that women are less likely to be at least moderately proud of their body or more (43 percent compared with 59 percent of men). So it makes sense when we look back at the data showing that 54 percent of those who are at least moderately proud of their body have received a raise or promotion in the past year, compared with 46 percent who aren’t. Because only 48 percent of the women in our survey say they received a raise or promotion in the past year, compared with 55 percent of men. All-in-all, there’s something to be said for moderation in many things, especially when it comes to how often you’re thinking about how you look and how important your appearance is to you. So take a good look in the mirror—but not for too long, unless you’re focused more on what’s on the inside than on what’s out.